As a gathering place for students at the University of Florida, the J. Wayne Reitz Union has a great deal to offer. Built in 1967, the 648,173-square-foot facility features a range of spaces and operations — a bookstore, two ballrooms, 23 meeting rooms, two auditoriums, nine food service locations, a four-story atrium, a game room, two dance studios, and a parking garage. 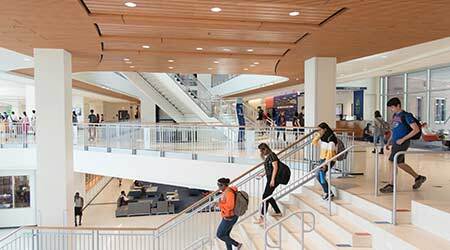 But along with that vast array of offerings comes a multitude of issues related to inspecting and maintaining the building and its systems and, when necessary, upgrading and renovating systems and equipment in order to keep pace with evolving demands of an ambitious and active student population. The management challenge that fell to Mike Mironack, the union’s director of operations, in 2009 was familiar to many managers — an aging facility, a growing mountain of deferred maintenance, and the need for a strategy that would enable the maintenance and engineering staff to bring the facility into the 21st Century. One of the first steps for Mironack, who has been with the university for 25 years, was to assess the facility’s condition, as well as systems and components that needed attention. Another step in the assessment process was determining the way students and staff interacted with the union and understanding their expectations of the facility. One key piece of funding for the upgrades came from an energy service contract (ESCO).